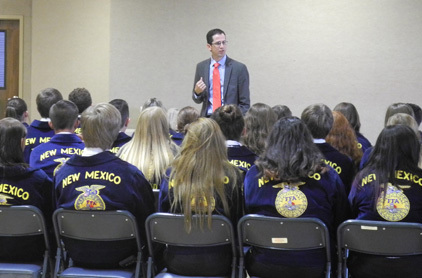 Artesia native and 2005-06 FFA western region vice president Stuart Joy, pictured above, gave the opening address to more than 80 New Mexico FFA members this morning to kick off District V’s COLT (chapter officer leadership training) in the TLC of First Baptist Church. COLT is where FFA officers across New Mexico are trained in the skills of leadership to contribute to the success of their chapters, district, and state, and is facilitated by the State FFA officers in conjunction with their representative District officer teams. Savannah Graves reporter-Hagerman FFA and Anna Blake sentinel-Hagerman FFA. These district officers will then break the chapter officers into groups and provide training for them to take back to their individual chapters on the importance of SAE’s (supervised agricultural experience) and how diversified they can be.